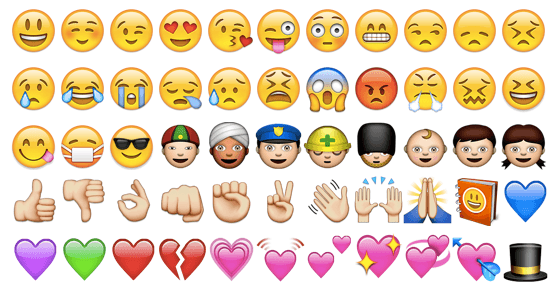 Emojis – also called ‘smileys’ in common parlance – are barely fifteen years old today. And yet, going by their usage, one can say that the ‘emoji language’ is fast emerging to be the first truly universal, global language that the entire world is using to communicate with one another. First came what we know as ‘emoticons’, in the early 19th century – simple pictorial representations of facial expressions in the form of punctuation marks, numbers and letters. Having been used extensively across several online forums, games and even on instant messenger, these emoticons eventually gave way to the more popular ‘emojis’ – which are small digital images used to express ideas or emotions across various media of electronic communication. SwiftKey, a British software mobile keyboard company decided to carry out a study with a limited group of emoji users, believing it to be indicative of the larger trends across various countries. The time period under study was from October 2014 to January 2015 where 800 emojis were organized into 60 different categories and more than a billion pieces of emoji data sent by millions of its users from all over the world were analysed. This study resulted in the ‘Emoji Report’, which ranks the emojis in question from the least to the most popular, thus providing a fascinating insight into the texting habits of Smartphone users of different countries. The English speaking nations – UK, USA, Canada and Australia – showed traits which were quite distinct from one another. UK seems to have the best sense of humour of all, emerging on top as the nation of ‘winkers’, with twice the average percentage use of the winking emoji. America is the leader of the pack when it comes to food – meat, pizza, cake (even eggplant, for some weird reason!). It is also ahead with respect to female-oriented emojis – lipstick, tiara and clothing. LGBT emoji usage was recorded to be highest by the Americans as well, a whopping 30% more than the average. Canadians score the highest when it comes to money-related emojis, using them twice as much as anyone else. They are also the sportiest of the lot, leading the world in the usage of emojis related to sports. Australians like to party hard and know how to live it up – alcohol, holidays and fast food (including those appetizing French fries). Well, that decides where you should head to for your next holiday to indulge yourself. Positivity, romance and weddings abound in the French speaking folks with almost 55% of the total emojis sent by French people being hearts – no wonder French is known far and wide as the language of romance! Russian speakers come a close second on the romantic front; but seem to be a little behind on their sense of humour. They seem to be mostly occupied with the weather and snowflakes. Arabic speakers are avid users of the flower and plant emojis, their particular favourite being the rose. What comes as no surprise is that the Arab-speaking people use two-thirds more sun and heat-related emoji than any other language. To put it all in a nutshell, let’s look at it this way: The world is happy in general, with happy faces (including the ‘wink’ emoji or the ‘guffaw-with-tears-streaming-down-your-face’ emoji) accounting for more than fifty percent of the total emoji usage. Moreover, looking at the regional takeaways from the results of the study, one can safely conclude that there are certain prominent distinctions between the ways emoji are used by the people of one region speaking one particular language and those living elsewhere and speaking a different language. There have been debates on and off about how emojis need to be more ethnically diverse than they are at present. But as we move towards a world wherein people would rather send a message on Whatsapp consisting of a pair of clapping hands and a dancing woman in a red dress rather than the simple sentence, “I am very excited!” in a short message, one thing is for sure –the emoji language is here to stay. What was originally invented as just a way of signifying the tone of a message online is fast evolving into the first genuine, universal language which transcends all barriers of language, all over the world. On the local front, Buzzfeed recently asked their users about the emojis that they would like to see on their phones. While tandoori chicken and cutting chai came in as front runners with food, PM Narendra Modi and Shah Rukh Khan were famous personalities in demand. Popular phrases like ‘Horn OK Please’ and aiyoo were the choice of Indians.